How, one might ask, are free hot dogs along the Brooklyn waterfront this summer, art? Over his three-decade career, Austrian artist Erwin Wurm has recast the concept of sculpture from a static object — as observed in the Louvre or along a Roman piazza — into a dynamic and participatory act. While all artwork involves careful looking or listening, Wurm’s artistic vision requires viewers to physically activate his pieces that can take place anywhere. In his celebrated, One Minute Sculptures, a brief set of instructions or diagrams accompany Wurm’s artwork. “Head TV” is emblematic of the series. It consists of a Danish media console, with a hole cut in the center; the directions prompt the viewer to place his or her head inside the furniture and hold a specific pose for nearly a minute. “Double Bucket” meanwhile invites participants to stand inside a bucket while donning another as a helmet. Wurm’s practice involves a choreography between the human body and art. Using deconstructed everyday objects in surreal and satirical mini-performances, his fleeting sculptures often highlight consumerism’s environmental effects. In 2017, at the Venice Biennale, the so-called art Olympics, Wurm balanced an upturned freight truck on its cab outside the Austrian pavilion. Visitors climbed a staircase to a viewing platform, instructed to “stand quiet and look out over the Mediterranean Sea.” Inside Austria’s pavilion, a new One Minute Sculpture directed Biennale-goers to contort themselves through holes in a mobile home. The exhibition: a reflection on mass migration, contrasting vacationers along the Mediterranean’s legendary beaches and refugees on its shores. 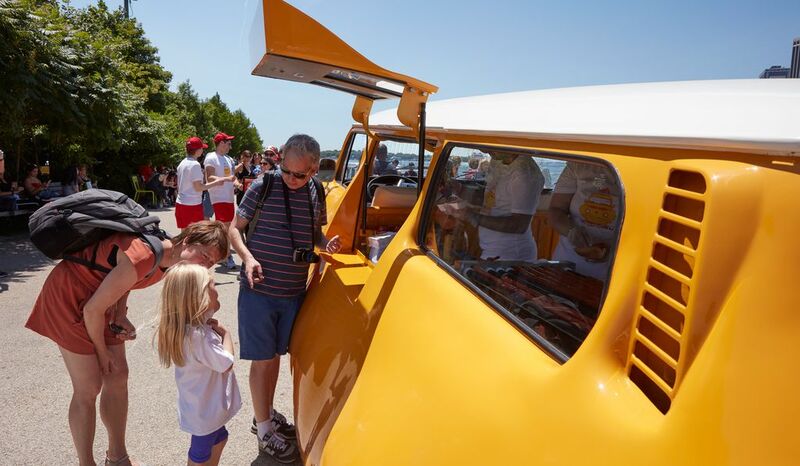 In June, Wurm debuted his latest work “Hot Dog Bus”— a puffy Volkswagen Microbus, part of his ongoing Fat Cars series—in which free hot dogs are distributed each weekend to passers-by at two locations along the Brooklyn waterfront. He discussed with Smithsonian Second Opinion the social and sculptural significance of eating hot dogs— and how the ephemeral nature of his artwork is ever more trenchant in our present time. Curated by Daniel S. Palmer for Public Art Fund, Hot Dog Bus is on view every weekend through August 26 tin Brooklyn Bridge Park. 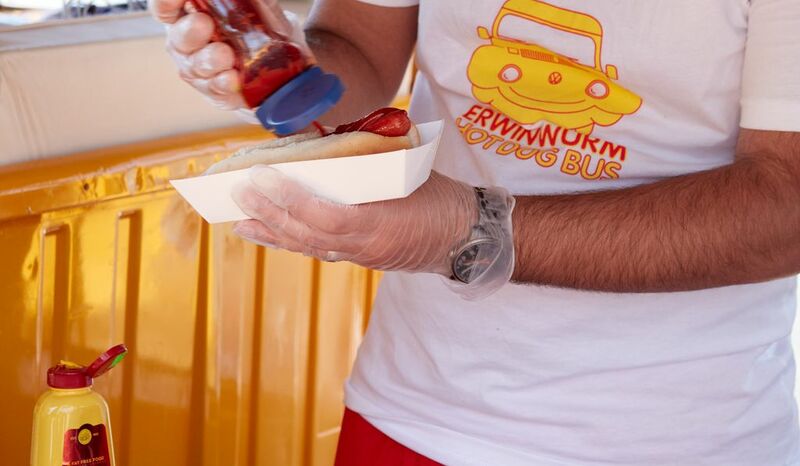 “Hot Dog Bus” is your first public art project in New York City. Why does public art matter? I’ve been interested in public art—bringing art out of the gallery and museum— for many years. Consider European classical art: It was public art in the squares and in the streets. I believe strongly that the best piece of art, the best painting— let’s say the Mona Lisa— doesn’t count [if it’s] in the basement and nobody sees it. An artwork cannot express intellectual reflections about beauty or questions about anything if nobody is there who can read it. A piece of art doesn’t exist without any viewers. And it’s the same with public art. I want art to go outside of the gallery, to meet other people and try to involve people who are not directly connected to contemporary art. 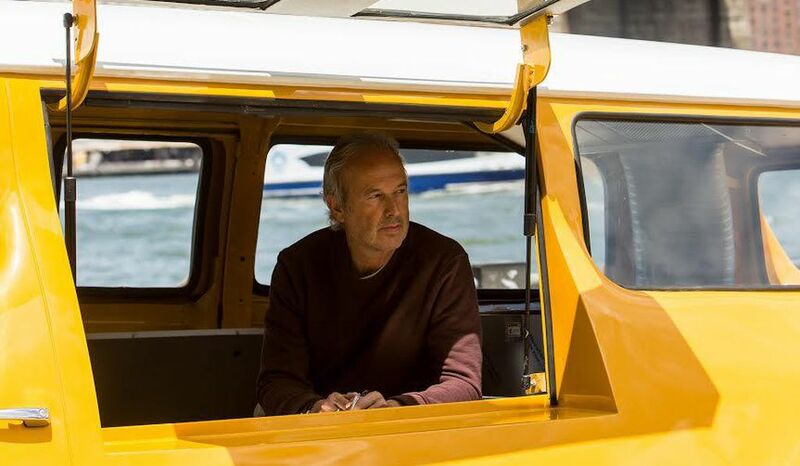 Why this spot, Brooklyn Bridge Park this summer, for “Hot Dog Bus”? From this space, Pier 1, where we are now, you see downtown Manhattan; you see the Statue of Liberty and Staten Island. You see all these magical points where so much American history took place—the history of immigration. I find this very exciting. The second location, Pier 5 is also close to the Brooklyn Bridge. You look out at Manhattan from the other side as the background for this piece. It’s just fantastic. Let’s talk about hot dogs. How did you arrive at this artistic point? It started with sausages. Sausages are icons of European food for working=class people. For centuries, in countries such as Austria, Germany, Switzerland, Poland, sausages were always winter food because we have a year of winter. We had no vegetables; we had no potatoes, no tomatoes; we didn’t have bread products that came from the U.S. Sausages were a food that could be conserved in summer for the rest of the year. Most people were too financially constrained to have meat every day. They allowed themselves only to have meat once a week and they chose cheap meat. So hot dogs are a reference to your Austrian childhood? I grew up in the ’50s and ’60 s in Austria; it was a poor society still after the Second World War. New products didn’t arrive in Austria for some time. The sausage, beer, and the pickle are symbols. The hot dog itself never existed in Austria, but we had bread with sausage in between it. “Hot Dog Bus” is the American version. Quite often in my work, I start with basic, general forms, like sausage, pickles, or dumplings. I’m very much interested in these things because they exist in millions of varieties, but you recognize exactly what it is in a tenth of a second: it’s a sausage; it’s a pickle. With these food symbols, I try to ask social questions and criticize specific habits of consumerism. States. It’s this whole connection and interaction which I like. Your work often requires people to physically engage and activate it. What led you to rethink the definition of sculpture this way? That aspect of physical engagement evolved in the history of my work. You make something: There is the act of doing something creative with the art piece and then there is the art piece. In the Renaissance, Michelangelo said that you should be able to roll a sculpture down a mountain, and it should still exist in a thousand years. But that is not a synonym for our current time. I started thinking about creating something which is a really strong synonym for our time— and that’s short living artwork. We all throw things away. But we pay a cost when we dispose things and we don’t repair our watches or radios or iPhones. As an artist, I try to focus on the synonym for our time— the short living. For some pieces, in fact, the existence of my art is getting shorter and shorter. Normally, when you go through a gallery or museum show, you look at things. My One Minute Sculptures are a performative sculpture which needs someone who accepts the limitation to follow my instructions and do something participatory. Does participation make art more accessible? I’ve never worried about whether my art is accessible. This never concerned me because we have always had the feeling that yes, there was very elite art that was bought by a certain segment of society. Many very rich people might have pieces of art that are high-end in their apartments. But this never concerned me. I am much more interested in the observation of German artist Joseph Beuys that everybody can be an artist. So the act of eating the free hot dog is itself art? Everyone gains or loses weight, and weight is a cultural norm. But to gain or to lose weight means to change volumes. When you change volume, you change content. This is precisely what is so interesting to me about “Hot Dog Bus”. This work is about the base of sculptural motion, about volume, and change— transforming human mass through fat and the process of eating. Then, when you allow those social issues to enter, you all of a sudden have an interest the component. And that is the essence of my artwork. Is the bloated or chubby shape of the VW bus intended as humorous too? I don’t like the word humor. I am not a joke teller. I offer a way to look at our realities form an angle of paradox or obscureness in order to see what’s really going on. Yes, a part of paradox is also humor, but it’s not about laughter. What role does your art play a role in times of particular political or social upheaval? Unfortunately, not much. I believe art is political but you cannot change politics. In the ’60s, everybody believed— including me— that we can change politics with art. We cannot. What we can do is sensitize the public and hopefully change the way another individual thinks about something. That’s it. You do learn by what artists are offering you to engage with. I’m not only speaking about visual or performance art, but about poetry, literature, and philosophy. There is a gigantic potential as an individual seeing or reading or listening to art. I remember there a famous sign from the ’70s: Music is the healing force of the universe. I think that quote is true for all art. 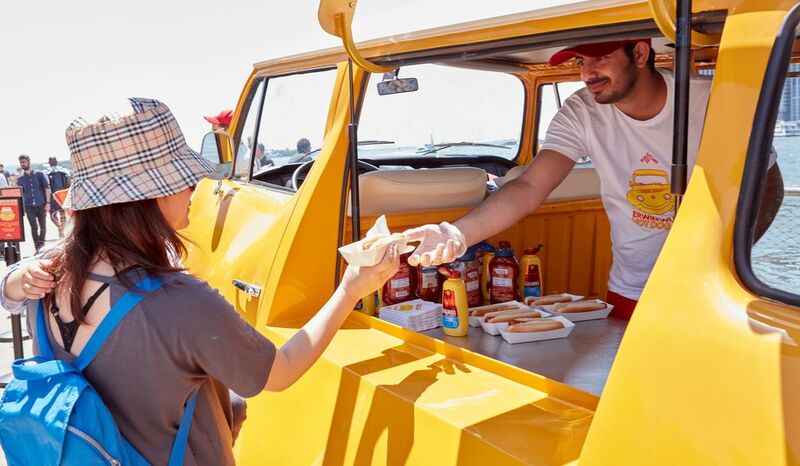 How do you want people to interact with “Hot Dog Bus”? What will you consider a successful intervention? I don’t have these kinds of hopes. I enjoy very much and I am very happy that “Hot Dog Bus” is here— and that people are interacting with the piece and eating the sausages and that’s it. As an artist, I’m happy with this.